1),Compare with mined diamond, DOVEGGS H-I moissanite is as beautiful/briliant and lasting as H-I/VS grade diamonds,while price is less than 1/10 of diamond, at the same time moissanite could even be test positive by normal thermal diamond testers! 2),Compare with natural gemstones, Transgems moissanite enjoys 9.25 hardness which is only inferior to diamond's 10, this characteristics make moissanite the second hardest stone in the world, it is harder than sapphrie/ruby/emerald and all the gemstones. Moissanite will not abrade or fade and the brilliance will be life time.Each of our moissanite will come with a warranty card guarantee to be life time brilliant. 3),Compare with cubic zirconia and its kind. Cubic zirconia and variations are also very beautiful at beginning but will fade away fast in a few weeks. 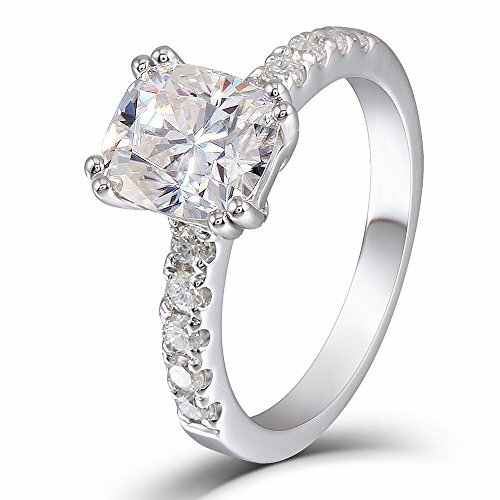 Center stone is 2ct(7*8mm) H-I color cushion cut moissanite, Accents stone total 10 pieces of 2mm moissanite. H-I color (near colorless-will not look obviously yellow). Excellent cut - designed to maximize the reflective brilliance of the Moissanite (higher-than-diamond reflective index) - looks more like a diamond than competing products. Ring setting is solid 925 Sterling Silver (92.5% pure silver) with a thick Rhodium (part of the platinum family) plating - typically used on white gold. So it will not tarnish and is non-allergenic, plus it looks bright, elegant and exquisite. If you have any questions about this product by DOVEGGS, contact us by completing and submitting the form below. If you are looking for a specif part number, please include it with your message.